Last day today and decided to take the road to Exeter then the B71 and B72 to Deloraine. A bit of a round about way but better than the A1. From Deloraine it was out to Mole Creek and up the mountains to Moina stopping for our usual last look at the Tiers country at the Round Mountain look out. The last leg was along the Forth River to Devonport for a Guinness or two before boarding the Spirit of Tassie. Bye Bye Tassie until next time. 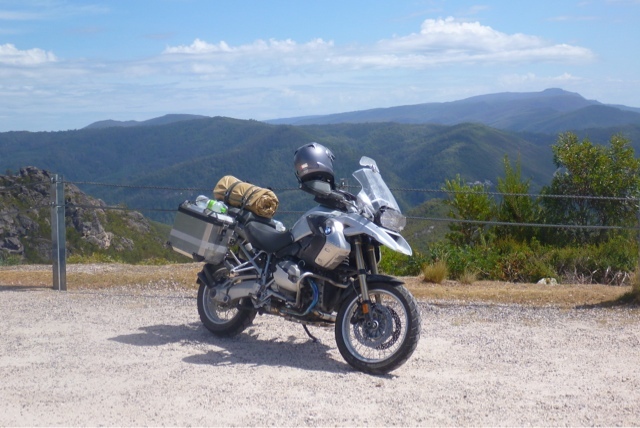 I can remember my motorcycle trip to Tassie on my first bike, the Ducati. My skills were non existent, each curve a death threat, my back ached, distances took for ever and I was passed by every vehicle on the road. Now it is effortless, fluid, fast and fun and I do the overtaking, but one thing remains the same, Tassie, ts roads, its scenery, its people.